Audrey and I had a delightfully girly day at home together today. First up, a haircut for the little one, followed by a spot of grocery shopping and an ice-cream treat at a cafe (her, not me). It's been over 30 degrees for days now & the forecast says up to almost 40 next week. So hot. What happened to Spring?! 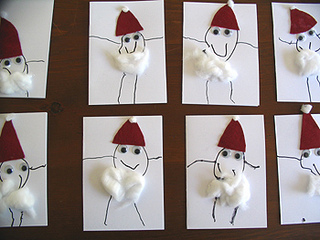 I'm really starting to feel it, so we spent the hottest part of the day indoors today making Christmas cards. These Santa cards were inspired by these (scroll down) over at the wonderful Kid's Craft Weekly. Lots of fun, and I love how they turned out. Audrey had a ball, she's the perfect age for Christmas crafts now. I think we'll be depending on that in the hot weeks ahead!